Welcome to South America’s largest and most populous country. 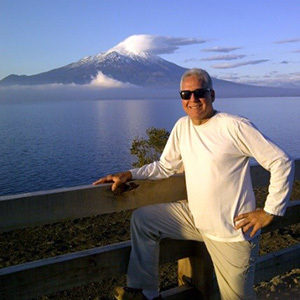 This evening, meet your Tour Director and fellow traveling companions for a welcome dinner at the hotel. 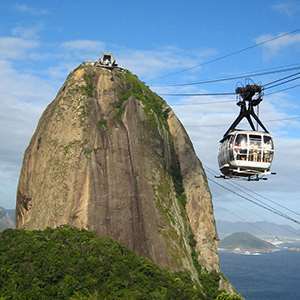 Today, visit the statue of Christ the Redeemer crowning CORCOVADO MOUNTAIN, a rounded peak rising 2,300 feet from the bay below. Take the scenic cog railway ride to its top, where a 360-degree panorama affords sweeping views. Proceed to bustling downtown Rio. View the Sambodromo and visit the CATHEDRAL. This afternoon, you may wish to join an optional trip into a local favela to see where 20% of Rio’s population lives. Visits include a community center and a school. This evening, it’s off to a CHURRASCARIA for a feast of barbecued meats marinated and roasted over charcoal in true Brazilian style. 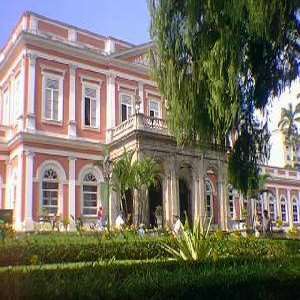 Enjoy a day of leisure or consider an optional trip to historic Petropolis, once the former summer palace of Emperor Dom Pedro II and now a mountain resort. 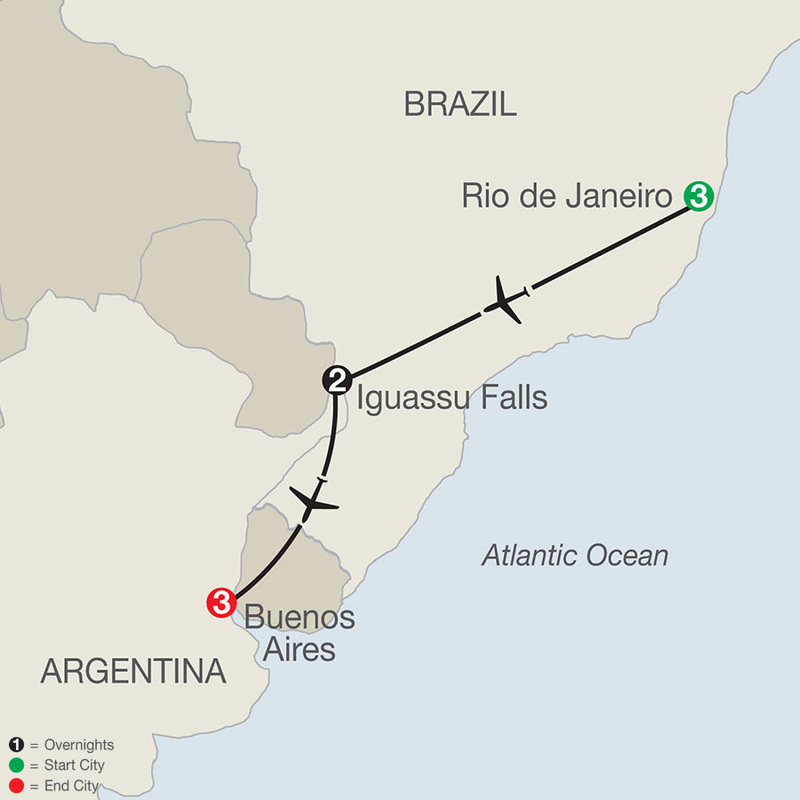 A flight from Rio takes you to IGUASSU FALLS. Experience the clouds of spray, the incessant roar, and the surrounding luxuriant tropical growth that make this an unforgettable natural wonder. Head into Brazil’s Iguassu National Park to enjoy the magnificent panorama of waterfalls from the Brazilian side. Your Local Guide introduces the spectacle of this 2-mile-wide torrential downpour, with some cataracts as high as 250 feet—it’s nothing short of hypnotic! Today is at your leisure to explore the area on your own. Your Tour Director will have suggestions for your free time. 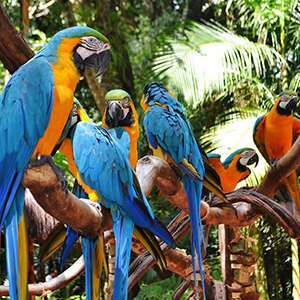 This morning, journey to the Argentine side of IGUASSU FALLS, where you will take the ECOLOGICAL JUNGLE TRAIN and enjoy a closer perspective on a walking tour of the falls. Meander along the walkways from atop the falls, and enjoy an exhilarating perspective looking over the precipice of the falls as the water plunges to the rocks below. Next, fly to Buenos Aires. After arriving, an orientation walk acquaints you with the “Paris of South America” and its wide boulevards and outdoor cafés. Your sightseeing starts in La Boca, a colorful district and site of the city’s first port. Take a short walking tour of this unique neighborhood and then on to San Telmo, famous for its late-colonial buildings and a popular gathering spot for artists. At Plaza de Mayo, see La Casa Rosada (the President’s Pink House) and the METROPOLITAN CATHEDRAL, housing San Martin’s Mausoleum. Drive past the ornate Colon Opera House before reaching RECOLETA CEMETERY, burial site of Eva Perón. After an afternoon at leisure, top off the evening at a famous TANGO CLUB. Start with a farewell dinner featuring Argentine steaks and other local specialties, and end with a show featuring flawless performances of Latin America’s most sensuous dance—the Tango! Today is free to explore on your own. Perhaps take an optional excursion to the heart of the pampas (grasslands) and immerse yourself in the atmosphere of rural, country life at a working Argentine estancia (ranch). 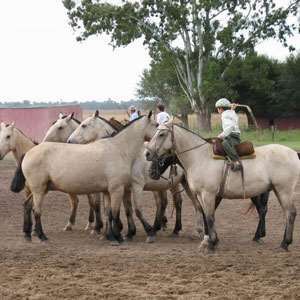 After a traditional welcome with empanadas and local beverages, get acquainted with the lifestyle of real gauchos (cowboys) on a horseback ride or carriage ride through the pampas. You will also enjoy a colorful feast, complete with world-renowned Argentine beef, salad, desserts, local wine, and live music and dance by the gauchos themselves. Top off the day with a horsemanship show by the gauchos before saying adios to the countryside and heading back to the city.